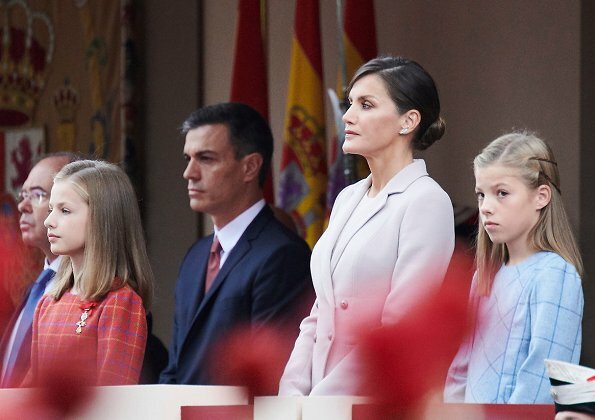 King Felipe, Queen Letizia, Crown Princess Leonor and Infanta Sofia attended National Day 2018 parade held at Plaza de Lima in Madrid. 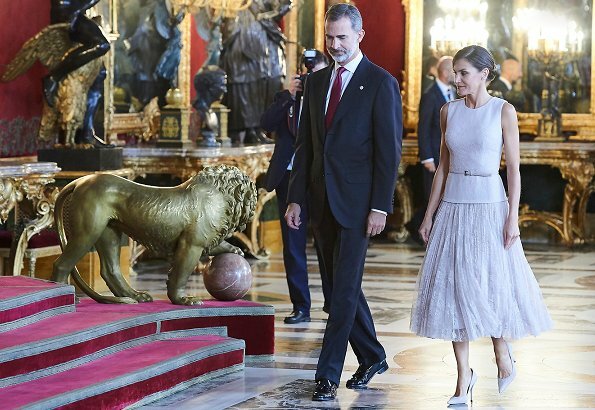 Afterwards, the King and the Queen hosted a National Day reception at Madrid National Palace. This holiday is always celebrated on 12 October. It is Spain’s National Holiday and is also known as Hispanic Day or Fiesta Nacional de España or Día de la Hispanidad (in Spanish). This national day memorializes the date when Christopher Columbus first set foot in America. She wore a jacket with skirt! Her hair and makeup is great but I don’t care for the froo-froo, sleeveless outfit. It makes her look like a doll. I like the style and the cut, specially the very lovely skirt, and so much better without the jacket, although I understand that it's needed for the outdoors ceremony. I don't particularly like the color, it makes her look washed out and pale, hopefully it looked much better under natural light. Appropriate hairdo, but also quite severe. The girls are lovely as usual. I like this look; kind of ballerina - style. Primaballerina of course. The hair, the colour, the skirt...yes, I really do like it. I don't really like the colour neither. They are holding hands! How cute! They so rarely show any affection & he rarely smiles at her that I was wondering if all was well with them. Glad to see them happy. la veste ne va pas avec l'ensemble, jupe et top. Mon dieu que son visage est dure avec ce chignon. Not my favourite Letizia outfit - it's a bit wishy washy in the colour. I like the floaty skirt part. The girls look lovely - Sofia in particular is beginning to look really quite mature. This time, I do not like the cut of the dress nor the jackett. Spanish National day. The Queen looks fantastic, like the outfit both way's, with or without the jacket.The girl's dress's look nice too, not so childish as a while back. This outfit looks a lot like the beautiful royal blue dress that she wore to one of the Princess of Asturias functions last year. The floaty skirt can probably be paired with something black or a darker pink in the future. This family is always color coordinated. The little ones are wearing the colors of papa's uniform decorations. 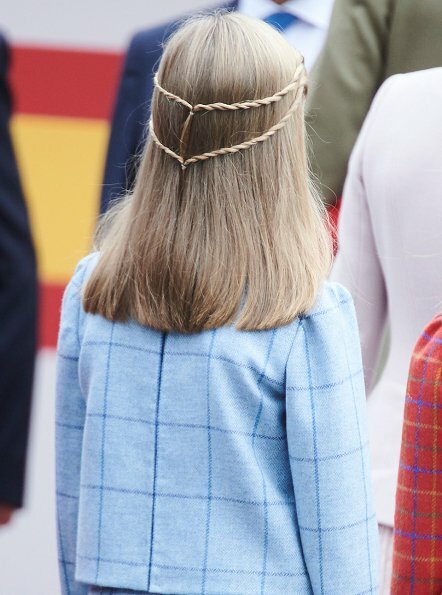 The Princess is being given more attention in institutional events so mom probably opted for a discreet color. Never thought of that but it makes sense! 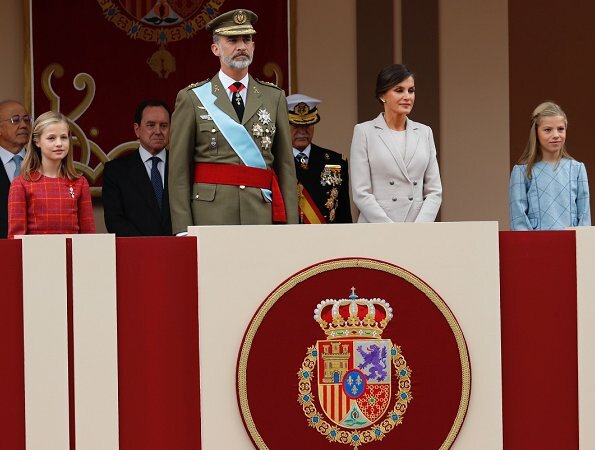 I really do not Letizia's outfit with the jacket. It is boring and dowdy. The color does not help. It looks much better without the jacket. Her hair is also very severe, which in this case is aging. The girls look cute, but I wish they would wear more grown-up shoes. I do think they are too young for Mary Janes. I am glad that they are not being allowed or forced to grow up too soon, but these shoes are too young for them. 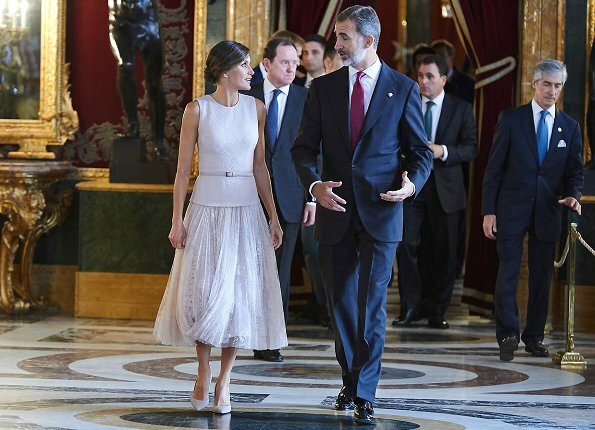 Letizia looks great, love her outfit and hair. She can wear all kind of styles and make them work. Leonore and Sophia are pretty girls. Beautiful dresses and hair. They look so confident and poised. Precioso conjunto de la Reina, vaporoso, romántico y perfecto con el moño de bailarina. La chaqueta tiene un corte y ajuste perfectos, como todas las de Varela y era necesaria porque llovió. 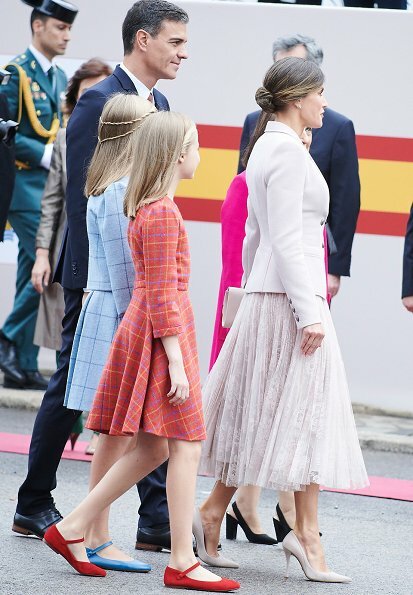 Leonor y Sofía tan bonitas y apropiadamente vestidas como siempre. Tienen unas cabelleras maravillosas. El Rey es fabulosamente guspo y elegante. The Queen's outfit seems to divide opinion. I'm not a fan. I agree with the comments on the washed out colour and that it does nothing for her. I'm not keen on the flouncy skirt either. It may have looked okay in something darker. The girls look fantastic. Outfits are both lovely colours and stylish without being too old for them. Lovely queen, lovely family allover. Conjunto apropiado y elegante, el color no me gusta mucho aunque bien mirado era mejor para no llamar mucho la atención. 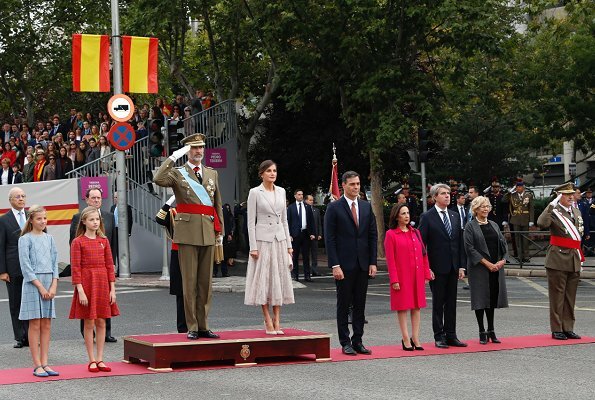 Hoy la protagonista era Leonor. Ese moño me parece demasiado rígido, los ha llevado más bonitos. 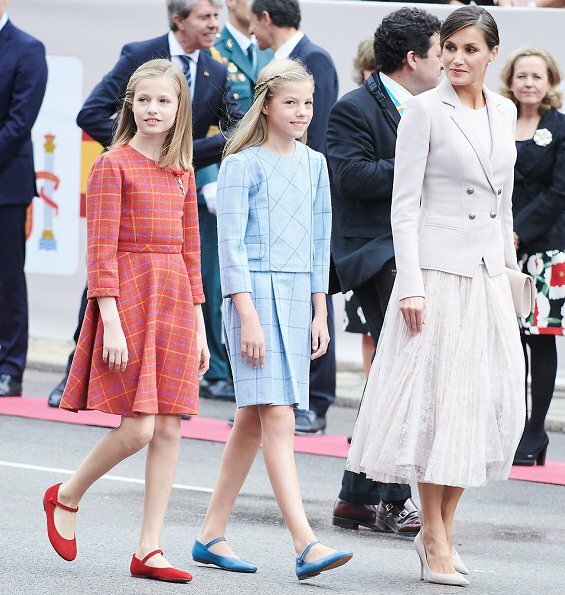 Letizia actually reminded me of the pretty ballerinas on some music boxes. There is even one picture where she seems to be doing a mini pirouette and the skirt swirls around her. Quite lovely. Strange coincidence, both Letizia and MC wore the same color and some similarity in their outfits on Friday at about the same time. Pink lace with a pleated skirt at the wedding for MC.